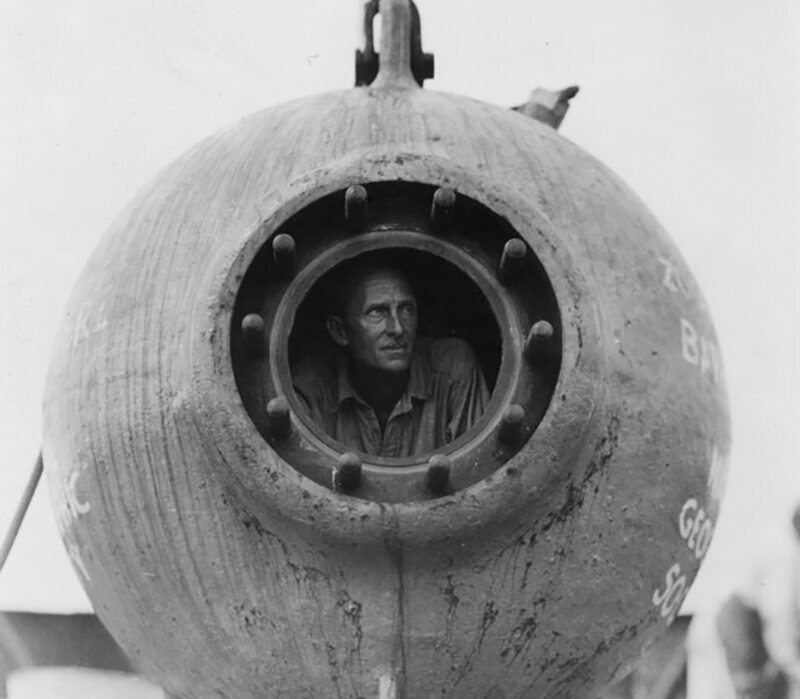 William Beebe in the bathysphere. IN THE SPRING OF 1930, a group of scientists and artists sailed to a tropical island called Nonsuch in Bermuda. They awaited a submersible called the “bathysphere,” which would bring the team of men and women deeper into the ocean than humans had ever gone before and permit the first studies of deep-sea creatures in their natural waters. The bathysphere—“bathy” meaning “deep” in Greek—was a hollow, steel ball less than five feet in diameter with three small windows and a steel cable to tether it to a ship. Engineer Otis Barton and boat architect John Butler designed it for an expedition led by William Beebe, a naturalist with the New York Zoological Society’s Department of Tropical Research. The record human aquatic descent at the time was a mere 525 feet and Beebe wanted to see what life was hidden further beneath the waves. In May, the completed bathysphere arrived at the research station. After several unmanned test dives and a short, manned descent to 45 feet, it was deemed ready for a plunge. 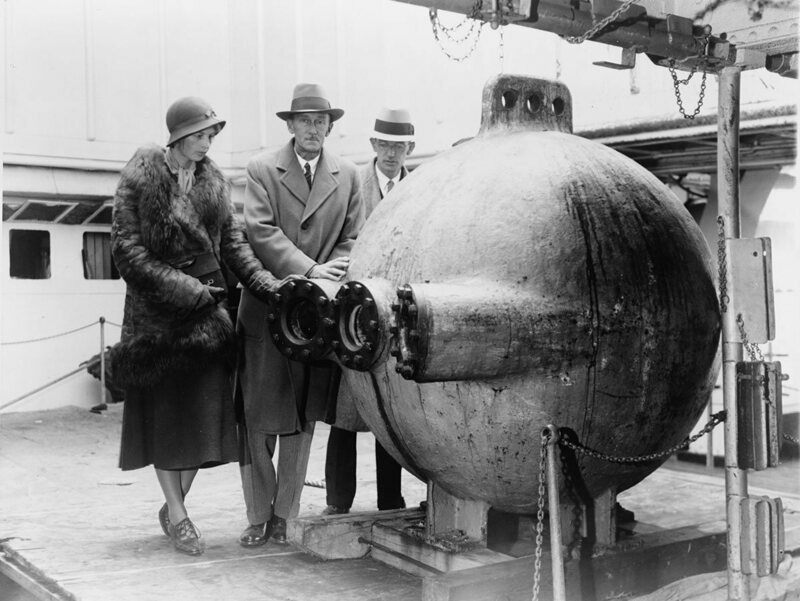 From left: Gloria Hollister, William Beebe and John Tee-Van next to the bathysphere, 1932. On June 6, a tug towed a barge bearing the sphere out to sea. Beebe and Barton wriggled through the pod’s 14-inch opening, arranged themselves on the cold, curved floor, and the crew tightened the lid. As reported in Descent by Brad Matsen, oxygen flowed from two tanks, trays of soda lime and calcium chloride absorbed exhaled carbon dioxide and moisture, and the men waved palm leaf fans about for circulation. Slowly the crew cranked the winch to raise the bathysphere up, over the ship’s deck, and down into the cerulean sea. 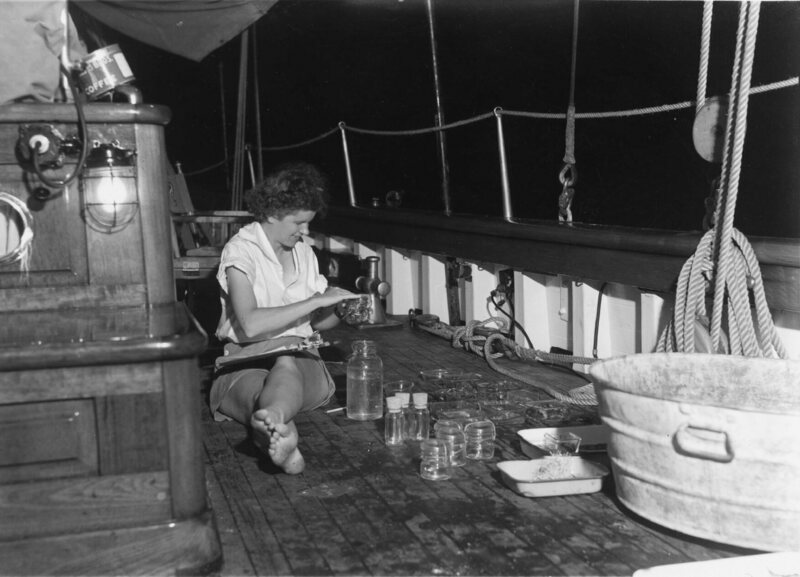 Gloria Hollister, the chief technical associate for the Department of Tropical Research, stood on deck with a telephone in her hand. She served as the passengers’ only line of communication to the world above—copying down Beebe’s every observation, relaying their depth, and passing on orders to raise or lower the sphere—via a telephone line clamped to the steel cord. Fanged and bioluminescent animals swam before the window. The blue ocean light was a strangely brilliant hue that the English language could not account for, Beebe wrote in his account of the expedition, entitled Half Mile Down. He and Barton were witnessing the gradual disappearance of each color in the rainbow as they were absorbed by the water above, an optical effect that produced nameless shades. They stopped at 803 feet that day, getting a glimpse of a previously secret realm. As summer rolled on the crew made more descents and meticulously recorded each lanternfish, eel larva, and sea sapphire that floated past the pod. The world’s knowledge of deep-sea fish came mostly from the practice of dragging nets through the water, but some fish could escape the nets and others exploded as the pressure dropped on the way up, leaving scientists with an imperfect picture of what lay below. Now they watched the creatures in their homes and were surprised to find that large fish could exist under the crushing pressure of deep water. After dives, nature artist Else Bostelmann took to her studio on Nonsuch and transformed Hollister’s notes and Beebe’s recollections of the animals into paintings. Her technical illustrations would be the primary visual documentation of the work in Bermuda, and would appear alongside Beebe’s words in National Geographic Magazinein 1931 and 1934. Though she painted much of what floated past the bathysphere’s windows, the “greatest fun,” Bostelmann said, “was actually to paint at the bottom of the ocean.” Some days Bostelmann donned a copper diving helmet with air hose attached, climbed down a ladder into the sea, and had her canvas and oil paints, which wouldn’t mix with the water, sent down after. 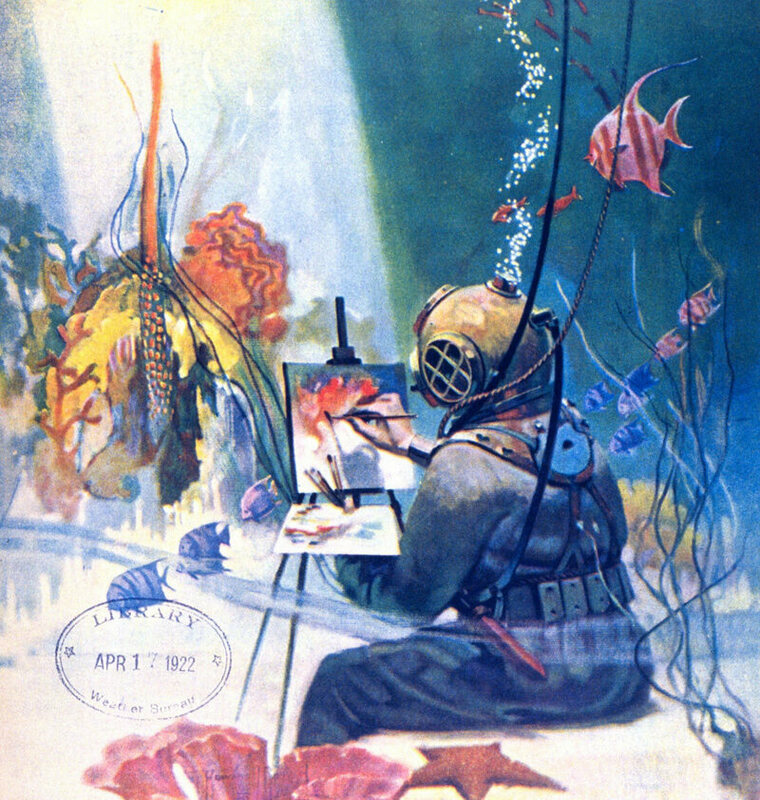 The May 1922 cover of Scientific American, “with waterproof paints and canvas: Painting a submarine scene at first hand”. In July another female researcher, named Jocelyn Crane, arrived fresh from college graduation. Critics chastised Beebe for hiring women in science, calling him “unprofessional. ” Beebe responded that he hired based on “what’s above the ears” and that he had chosen Crane and Hollister for their “sound ideas for scientific research.” Hollister and Crane continued to study sea creatures and dive in the bathysphere, and Bostelmann continued to paint in spite of these criticisms. On days the sphere didn’t descend, the team studied dredged fish in the lab. Hollister often used her own system of chemical baths, dyes, and ultraviolet light, to decolor fish organs until they became translucent. This revealed the red-stained skeleton and allowed her to study tail structures. Jocelyn Crane on an expedition in Manzanillo, Mexico, November 22, 1937, long after the bathysphere’s last dive. The sphere dove again into the world of languid siphonophores and flying snails in 1932, and on one descent, the National Broadcasting Company invited all of America into the deep sea, transmitting right from Hollister’s phone line. On another eventful dive Beebe reported two six-foot fish he did not recognize. They resembled barracudas, he wrote, but with bioluminescent lights down their side and two long tentacles, each with lights on the end. Beebe dubbed the creature Bathysphaera intacta—the untouchable bathysphere fish—but it was eventually reclassified as a new species of dragonfish. The bathysphere did not always lend itself to glamorous discovery. Dives were thwarted by bad weather and a roiling ocean. More than once the sphere came up full of water, releasing jets of dangerously pressurized water. After exhibiting at the 1933 Chicago World’s Fair, the bathysphere returned to Bermuda in 1934. That summer, Hollister set a women’s world record during a dive to 1,208 feet. On August 15, 1934, Beebe and Barton sat in the cramped steel sphere 3,028 feet below sea level. They rested about a tenth of the distance underwater that Mount Everest towers above sea level. 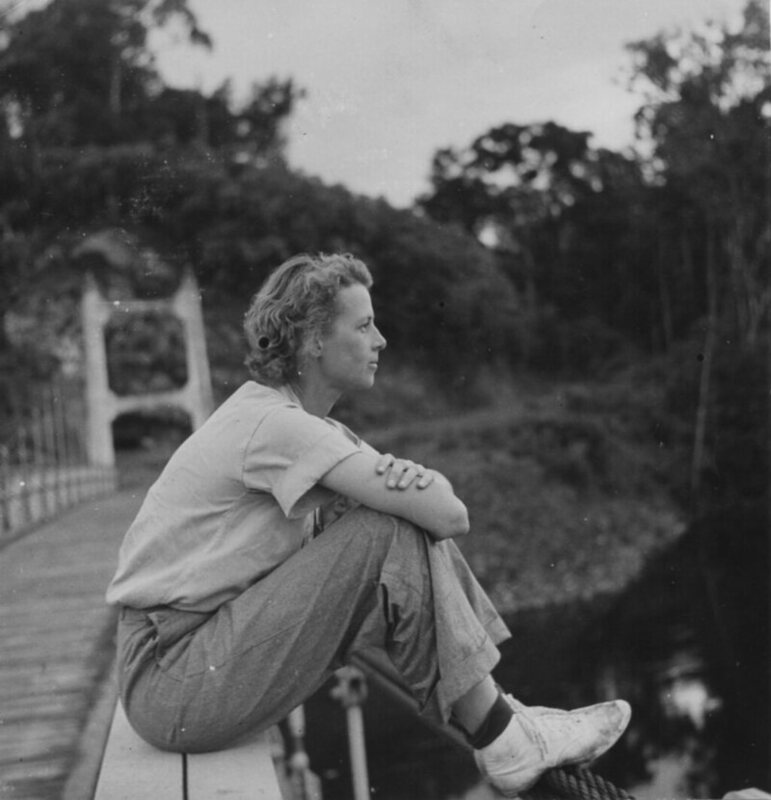 Gloria Hollister on a suspension bridge at Garraway, British Guiana (now Guyana), 1936. Submerged excursions proved too expensive to continue past 1934 given the sad state of the U.S.
Hollister took off to lead scientific treks in the jungles of British Guiana (now Guyana), while Bostelmann illustrated children’s books and painted for National Geographic. Crane and Beebe continued to work together and she took over as Director of the Department of Tropical Research when Beebe passed away. Barton the engineer turned to filmmaking with Titans of the Deep, a flop of a film that combined footage taken in Bermuda with invented drama. The bathysphere itself now sits on display at the New York Aquarium while remotely operated submersibles like the Deep Discoverer descend almost four miles into watery darkness. The Alvin can carry passengers down nearly three miles, untethered. But before them came a little steel sphere in Bermuda, the submersible that carried science into a new domain.